Mo Freitas has proven yet again that he’s one of the best paddlers in the world, outlasting an all-star field to claim the JM Survivor Race as part of the Quiksilver Waterman’s Festival at Huntington Beach today. After several rounds of short, fast, intense racing in the signature “Survivor” format, Mo triumphed over one of the most-competitive lineups we’ve seen all year, with the hugely impressive Aussie and freshly-minted Infinity team rider Toby Cracknell finishing a close runner-up ahead of a who’s who of the sport. Mo and Toby showed incredible consistency from start to finish, scoring just 14 and 18 points respectively (the lower the points, the better). Their scores after five full rounds of racing meant they finished, on average, in the top three or four on every single one of the knockout laps. This is the second massive result in the space of just 15 days for the under-rated Cracknell, who cracked the top five at the uber-prestigious Molokai 2 Oahu race a couple of weeks ago. These two results give Tobes some well deserved time in the spotlight after a very solid season of training back home in Oz. But while Toby came close, it was Mo’s day, with the Focus/QB team rider showing once more that he’s one of the most talented guys on a stand up paddleboard — no matter whether it’s long or short course racing, or big or small wave surfing, Mo Freitas is a machine. The victory here at the Quiksilver Waterman’s Festival will sit alongside his epic win at the Pacific Paddle Games surf race late last year, as well as his memorable sweep of the 2015 Payette River Games. 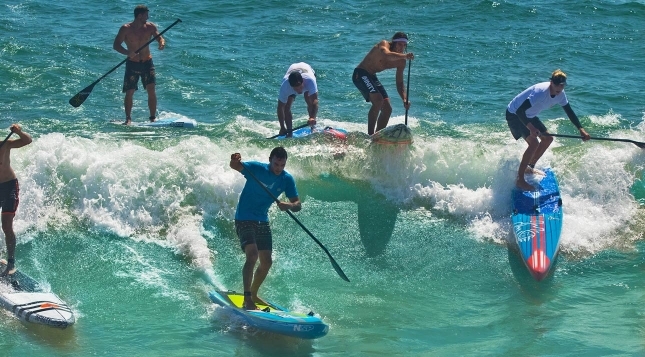 The men's SUP survivor racers are off at the @quiksilverwaterman Festival. Stay tuned for results. Mo walks away with $6,000 for his efforts, while he also scores a massive 47.00 points on the SUP Racer World Rankings, which will him leapfrog Casper Steinfath and Kai Lenny to become the new world number four the Men’s Top 100 Leaderboard is updated Monday morning (he’ll actually now be just one single point behind world number three Titouan). Toby will get a huge boost as well, easily jumping into the world’s top 20 (and perhaps even top 15) on the back of his very impressive effort today. Following the two young guns on the JM leaderboard today were superstars Connor Baxter, who won the final round but couldn’t make up for a poor opening lap, Danny Ching, who was edged out on a third-place tie-breaker, and Travis Grant, who backed up his Molokai heroics to show that he’s a true all-rounder. Connor looked sharp in the second half, and indeed he actually matched Mo’s points tally over the final three rounds, however an 11th place on the opening lap meant the Starboard superstar was always behind the eight ball. Danny looked sharp and kept his 404 board ahead of the chaotic packs on each lap, but an 8th place finish on the second round held him back from a potential top finish. Travis was looking very good, particularly on the second lap when he took the top points, however he couldn’t keep pace with the kids in the final few rounds and started adding too many points to his tally. Though the fact that Trav even backed up and raced this week when he’s still coming down from the massive high of Molokai was impressive enough on its own. Slightly further adrift were the world beaters Titouan Puyo and Michael Booth, who both showed that while they’re much better known as distance racers, they’re rapidly improving in the short course formats. The highly under-rated Josh Riccio, who himself is better known as a downwind master, also impressed to reach the “Final 8” race, which was reserved for those who survived the four earlier rounds of the knockout format. If you scroll down and look at the results, you’ll see that a dozen or more big names were knocked out before the final round, showing just how tight (and exciting) this JM Survivor Race format is. Special mention goes to Italy’s Leo Nika, who was on track for a top five overall finish points wise, but fell agonisingly short in the penultimate round and missed a place in the Final 8. Even closer was Infinity Speed Freak Giorgio Gomez, who was the unlucky ninth-placed finisher in Round 4, which meant he had to watch the top eight guys do battle from the beach. It was a see-sawing battle, with Jamie introducing a twist to his classic Survivor format that made paddlers work hard on every lap, rather than saving themselves for the final round as they may have done in the past. In years gone by, the result was determined in the final round alone, however Jamie added a unique points system to the Quiksilver Waterman’s Festival that added a new dimension. Competitors were rewarded with 1 point for a first, 2 for a second and so on, with the cumulative points of those who made the “Final 8” determining the final, overall standings. Some fast work by the timing crew and a big screen on the beach kept the crowd (and the paddlers) informed of the leaderboard standings as the rounds progressed. From everyone I’ve chatted to so far, and from the reaction on Facebook, it seems like the JM Survivor has become a very popular race format. It’s definitely one of the most exciting types of racing to watch, as the action stays close to the beach and the racing is short, sharp and intense. The format also keeps the result alive and unpredictable right until the finish, while the skill, strategy and endurance required from the paddlers make for a very interesting combination. At a time when we seriously need more exciting formats to grow the appeal of our sport beyond the core fans, the JM Survivor Race could be just what we’re looking for. It was another star-studded showdown in the women’s Survivor, although the smaller field meant there was five straight up rounds of racing with no elimination. With three different winners across the five laps, it came down to the finish. Annabel Anderson was untouchable towards the end, however a slow start in the opening lap cost her dearly. The world number one finished with a pair of victories in round four and five, however the supreme consistency of Candice Appleby – she finished either second or third on every lap – kept her ahead. Women's SUP survivor is off at the @quiksilverwaterman Festival! Stay tuned for results. But keeping herself even further ahead was the young gun and rising star of the women’s sport, Shae Foudy, who scored two firsts, two seconds and a fourth across the five rounds to finish on 10 points, 2 points clear of Candice and 5 ahead of Annabel. Today’s big win reinforces Shae’s status as one of the top women in the surf, and comes just two months after her victory in similar conditions (and against a similar field) at the Pier Paddle in Santa Monica. The result also gives Shae a massive boost on the World Rankings, with the Riviera team rider set to be knocking on the door when the Women’s Top 50 leaderboard is updated on Monday morning. Also impressive was Terrene Black, who won the second round but lost out to Annabel in a tie-breaker for third. Behind the Aussie was another name to watch in the future, Lexi Alston, while Bailey Rosen showed solid form all day to claim sixth. You can check out the full leaderboard below, then scroll down for a complete replay of the Live Stream, including commentary from event head honcho and creator of the Survivor Race, Jamie Mitchell. Check back on Monday for more pics, video and in-depth analysis. You can also @onitpro for plenty more video updates. Update: OnIt Pro has hundreds of great photos up on Facebook.